There are days where the world and all that’s in it seem colorless and dull. Days where it’s stormy and chaotic. Days upon days where it feels never ending and stressful, painful just to exist. Then there are days when it’s all sunshine and roses. Daisy days of laughter and giggles. There are days that the only thing I worry about are deepening laugh lines and new wrinkles from having had the biggest laugh/ugly cry brought on by crazy friends and good times. It’s not often they both exist at once. It was sunny and rays were streaming through our window and they were full tilt. The rain was sploshing huge drops upon our window and raining like a maniac. Thunder was rolling, the booms scaring the beejeebies out of us as they crashed around us. It made no sense hearing them echo on the heels of so much sunshine. One side of the sky was black. It was fierce. The other was peaceful and refreshing, newly washed and carefree. I sat in wonder at a traffic light, taking it all in. 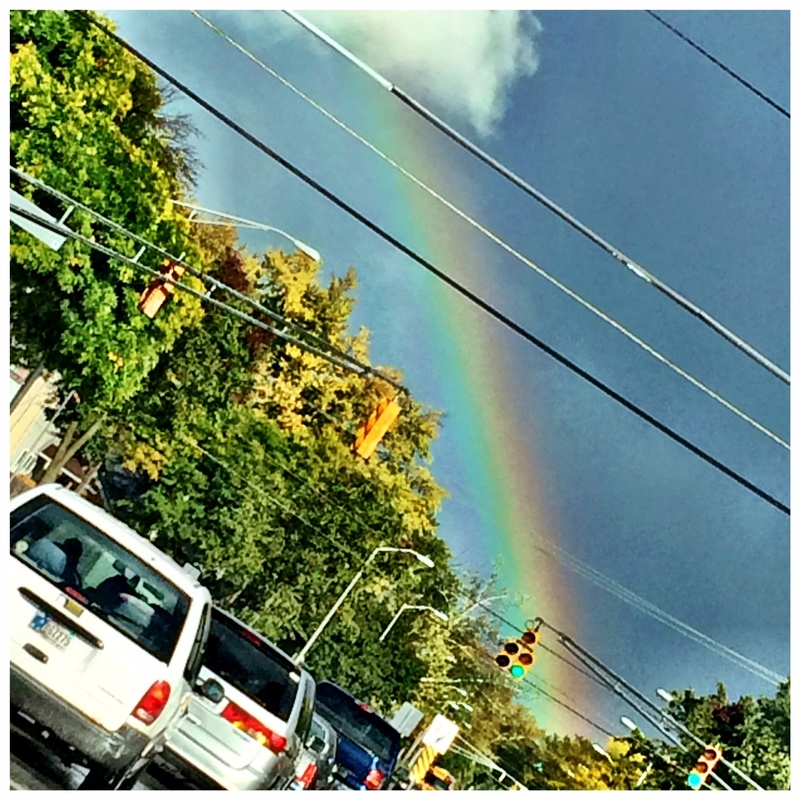 Then, just ahead, as the light turned green, I noticed a full rainbow climbing down out of the cloud overhead. 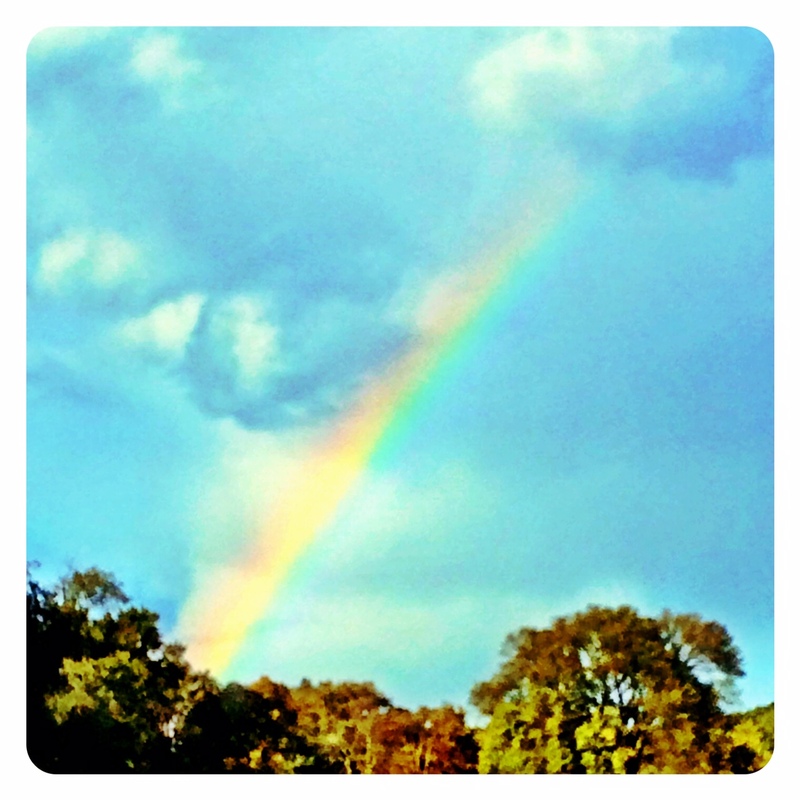 It was that picturesque kind of rainbow that I used to draw as a kid, a puffy white cloud with a rainbow stretching from it. It made me want to drive till I reached the end. I am only half kidding when I say I nearly did just that. Right now, sitting here looking at the picture I quickly snapped of it, I can honestly say I am sad I didn’t. I should have. Both the girls would have thought I’d lost that critical, final marble, and they’d have never let me forget. But how many days do I spend chasing rainbows? Not many times do I get to actually sit in my car and DO it. So I drove a while toward it and enjoyed the heck out of it, pretending I really was following the rainbow’s magical pathway, and turned only when I absolutely had to. It was a moment in time that sealed itself into my heart, my girls in tow, and the laughter is still caught up in my soul somewhere unescapable. I am often tempted to wish away the dark stormy days of life. I want to erase them with a magic eraser like I do the dirt from my doorways and window frames. The feeling is natural. If I succeeded, however, in erasing them all away, what would I compare my smiley white daisy days to then? A red rose-colored day, a simple yellow daffodil day, an outrageous orange marigold day, or maybe just a purple violet, or deep bluebell day?? I’d begin to pick apart the good to figure out just HOW good the good was. We NEED the bad days to counter balance the other kinds of things life throws our way. We need a way to appreciate just how far we’ve come, how good something is, how colorful it may be. So today, as I know not what the week fully holds in its coffer for me, I will be grateful for all it brings. I will know that whatever it sends my way is something that will grow me, stretch me, add a new crayon of color to my box and a new swipe of paint to my canvas. Want to know what makes me excited to get up each day? Want to know what makes me push onward and know I do have something to look forward to? Knowing that one day I will get to see this amazing painting that my life strokes have been busily creating right under my nose. THAT is what keeps me getting up each morning. Sometimes I almost feel like I am a subject with a painter standing in front of me, looking at my life, thoughtfully applying the brush here and there as the mood strikes, the moment dictates. I am sitting on the opposite side of this amazing masterpiece. I sit here, naked, with only the very essence of me to go from. One day I will get to see what the painter is creating, using me, my life, my colors, my impression. What do you have to look forward to? LIFE! Go live it. Everyday. Every single day there is a color to it, be it a happy daisy color, or a grey cloud of pain or frustration. Every single day is worth living because it’s worth that final masterpiece being perfect when it’s all said and done. I don’t want a single brush stroke missed. So well said. I think the bad times are what make us truly appreciate the good ones. Look forward to meeting you soon!